This is a great salad for lunch or dinner, and perfect for the nights you don’t want to heat up the kitchen, or spend a lot of time fussing over food. It was an entire, light and delicious supper for me, while my husband completed his meal by adding salmon. Whisk lemon juice, mayonnaise, garlic, Worcestershire, salt and pepper in a small bowl. Slowly whisk in oil to make a creamy dressing, stir in cheese and set aside. Heat a skillet over medium heat. Place bread pieces in medium bowl, drizzle with olive oil and toss to coat. Add bread to a hot skillet, toast, turning the pieces as needed. 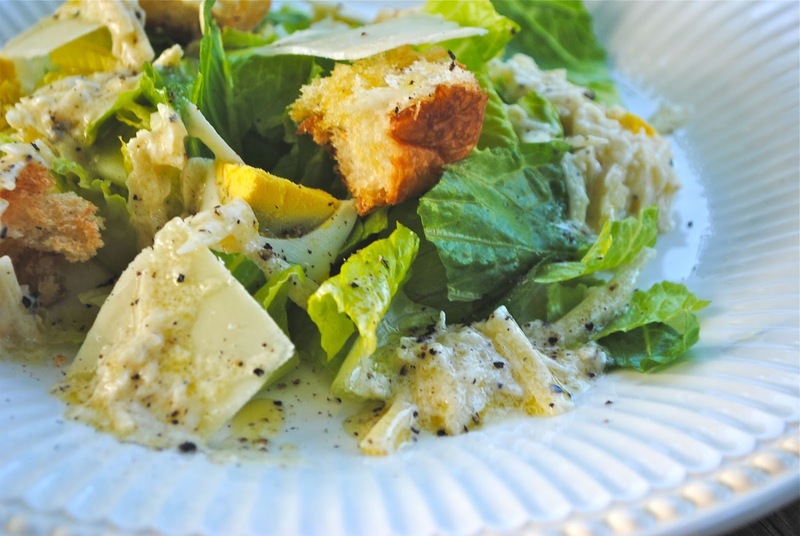 Place lettuce and egg in a large bowl, add dressing and toss to coat. Add bread pieces, tomatoes and cheese and toss again. Season to taste with salt and pepper.